One of the nation’s largest lifeguard certification agencies has stopped teaching a controversial drowning rescue technique that critics alleged was ineffective and potentially dangerous. The National Aquatic Safety Co. has long championed the Heimlich maneuver as an effective way to remove water from the lungs before initiating CPR on a drowning victim. 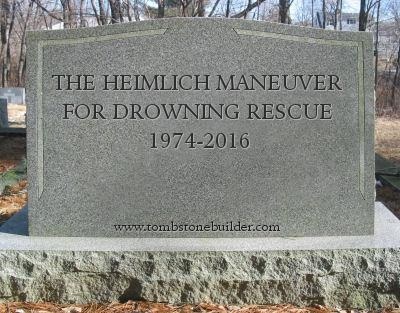 Developed in the mid ’90s by NASCO founder John Hunsucker, the drowning-rescue version of the Heimlich called for the lifeguard to first administer abdominal thrusts on a drowning victim in the water before extrication for CPR. The technique came under intense scrutiny in recent years as aquatic and medical professionals called the practice into question, claiming that it was ineffective and that it could further endanger those in need of rescue. Despite the criticism and the headlines in the mainstream media, NASCO stuck to its guns, even after the Heimlich Institute stopped advocating that the maneuver be used to treat drowning victims in 2012. ...Another development may have forced the decision: In recent years, health departments in New Jersey, Utah and Nevada, threatened to strip NASCO of its certification to to do business in those states unless it stopped teaching the Heimlich as part of its drowning rescue protocol, according to local media reports. “Presumably, NASCO finally dumped the protocol because it was affecting their bottom line,” said Peter Heimlich, son of inventor Dr. Henry Heimlich, and the most outspoken critic of using the maneuver to address drowning, in a statement to AI. Hunsucker declined to comment for this article. ...As for (Peter) Heimlich and his wife, Karen, who’ve been on a crusade to dissuade the public from using his father’s technique, this is chapter they’re relieved to see closed. It’s believed NASCO was the last such agency to perform what many considered an ill-advised rescue maneuver. For years, the Dickinson-based NASCO Aquatics, one of the nation's largest lifeguard certification companies taught a debunked rescue technique, even as other professional and medical organizations said it could further endanger drowning victims. NASCO founder John Hunsucker swore by the technique, even as the American Red Cross, American Heart Association, the United States Lifeguard Coalition, and the International Life Saving Federation. Most medical and aquatic experts have stated that applying the Heimlich maneuver to a drowning victim delays CPR and could cause a victim to aspirate vomit into the lungs. "I'm relieved that NASCO has finally pulled the plug on its reckless 'Heimlich for drowning' protocol. Experts have said that for decades NASCO was conducting what amounted to an unsupervised medical experiment using unsuspecting swimmers at their client water parks. Long after prominent medical experts and leading first aid organizations had thoroughly dismissed the treatment as useless and potentially lethal, NASCO persisted. Even after my father's Heimlich Institute stopped advocating the treatment, NASCO wouldn't stop. Click here for "These so-called medical experts. Screw 'em," my compilation of media reports about NASCO's now-defunct "Heimlich protocol." The result of their folly? Dozens of poor outcome cases -- including children. A special mention must go to writer Pamela Mills-Senn of Long Beach and editor Mike Moran whose landmark 2000 article, Water Rescue Sequence: The Controversial Role of the Heimlich Maneuver, was the Rosetta Stone for much of the research conducted by my wife Karen and me into my father's unusual career.